Over the years, a number of neurotic patients were induced by sociopaths to leave the groups or were otherwise damaged by them. As a consequence, we consider it preferable not to include sociopaths in groups, even though such treatment, when properly conducted, is more effective for them than individual therapy alone. is almost incapable of changing, has a marked inability to learn from his mistakes and has no desire for socially constructive goals. Many therapists nowadays speak of the ‘gestalt of the group’ and the ‘group mind’ as something above and beyond the individuals in the group. They attempt to deal therapeutically with the group as a whole in a global approach. Our contention, however, is that the trends in a group that give the appearance of a ‘group mind’ are actually resistance. As the transferences are examined, the resistive motivations of each group member causing such conformity become apparent. The therapist must analyze any neurotic submergence of the individual in the group and attack it until it is resolved. Psychotherapists can accurately describe the relationships in the basic group without using terms such as ‘gestalt’ and ‘group mind’. The use of such terms is unnecessary and misleading. We find that the patient’s co-operation can counter some of the resistive and repressive forces that tend to destroy the constructive aims of therapy. The following techniques might be less necessary in individual analysis, where the patient is seen several times a week, than in the extended groups. To prevent the patient’s insights from slipping away, the therapist reminds him, at appropriate occasions and in simple terms, of his particular neurotic patterns, but only to the extent that they have become known to the patient in prior therapeutic work. The patient is encouraged to remember those formulations and, on occasion, to reinforce the insights by writing them down. For instance, an anxiety-ridden patient who unconsciously assumed the role of his dictatorial father was thus able to maintain his cognizance of the behavior and, therefore, avoid some of its pitfalls. In other instances, where a group member is approaching awareness of a certain problem area—for example, hidden hostility, fear of abandonment, a need to malign threatening figures—the therapist encourages him to search, even between sessions, for associations and feelings, particularly those stemming from childhood experiences. The therapist makes it clear that focusing on problem areas and on already acquired insights and remembering such insights must not become mere intellectual exercises but should involve real feelings. Such suggestions, which are merely at the conscious level, are most often followed only half-heartedly by the patients and are not as valuable as the traditional psychodynamic techniques. However, they diminish some of the confusion and distortion into which the neurotic patient regresses between sessions. They give him something to hold on to outside the therapeutic situation that may help him deal more realistically with threatening environmental situations. It was the negative influences in the social world of the patient’s childhood environment that originally gave rise to his fears, suffering and emotional imprisonment. It is now the social experience of the therapy group, if the group is based on a valid therapy form, that helps him enlarge his awareness of reality and gain emotional freedom and depth. The therapist’s communications with the patients are in simple, non-technical language, always expressed on their level of understanding and referring to their own dynamics and their own imagery as evidenced in their dreams and fantasies. As each patient is constantly made aware of his emotional reaction to each group situation, he gradually arrives at a better understanding of both outer reality and his own feelings. The actual presentation and analysis of dreams occupy only about 20 per cent of the extended group sessions. That is considerably more than is possible in the usual brief groups. In fact, dreams are most important in this type of group work. After a patient tells his dreams, the therapist advises him to speak about the feelings experienced in them and to relate any associations. The patient’s understanding of his dream is aided by the associations, feelings and interpretations of the other group members. The therapist uses dreams to make the patient aware of the problem areas to which he must pay attention at each particular stage of his therapy. Constant parallels are made in the group between a patient’s dreams and his defensive and neurotic behavior. Furthermore, defenses and emotional reactions of the various patients are often compared and, similar, identical and opposite patterns are pointed out. It is important to realize that the dream of a sociopath may mean the opposite of the same dream in a neurotic. For instance, a dream that would show progress in a neurotic may well mean a lack of change or even a hardening of the asocial tendencies in a sociopath. We know that at the beginning of therapy dream material is often quite repressed and strongly symbolized—for example, patients may dream of animals, trucks, and so on, that threaten them. As therapy progresses, dreams become clearer and significant human images appear. That process often happens more quickly for patients in the extended groups than for those who have only one individual session a week. To achieve therapeutic effect, therapists who want to engage in this form of therapy should be skilled in the proper handling of dreams. Psychoanalysts hold, and rightly so, that transference is a key factor in treatment. If so, the extended group therapy method, far more than the usual group treatment, is indeed the psychoanalytic treatment form par excellence. Consider this: a patient spends 180 minutes a week with the analyst, the equivalent of four 45-minute individual sessions. However, in the extended groups he would spend 360 minutes a week with his fellow group members. In individual therapy the transferences toward father, mother, brother, sister and other childhood figures are projected onto a single person—the analyst. In the extended group those transferences are unscrambled and crystallized—that is, they are projected onto separate individuals. Assuming that for a specific patient the male therapist represents father and other members represent other family members, his transference reactions and distortions will be clearer in the group interaction, and in his dreams and fantasies as well. All claims to the contrary notwithstanding, individual analysis does not, and cannot, offer such clear insight into the manifold transference factors operative in the patient. What may remain obscured in individual analysis has a good chance of being revealed here. The frequent difficulty in obtaining a satisfactory understanding of a patient’s intrapsychic structure and functioning has been a prime factor in inducing the less gifted analyst to turn to the facile and superficial interpersonal and group-as-a-whole approaches. The conscientious and competent therapist, on the other hand, undertakes the more difficult task of gaining the full picture of the patient as an individual, a task without which no solid reconstructive work is possible. As stated, to make possible the emergence of a variety of significant transference relationships, the therapist has to pay great attention to group composition. The transference relationships are allowed to develop and are elicited during the group session. Focusing on the transference involvements, the therapist asks the patients to associate to the feelings they are experiencing. Those associations are to both recent experiences and childhood experiences, especially within the original family. The procedure brings out the significance of the transference reaction: where it originated, how it has been reinforced and why it results in defensive and resistive behavior. Free associations in the group are generated under circumstances often different from the relative calm of individual sessions. Both procedures have their own validity and attraction for an analyst but the group therapist must forgo the cherished and valuable tool of free association as practised in individual analytic sessions. Thus, although the therapist will undergo an emotional loss, as if a dear friend has departed, he will find that the multitude of reactions and associations brought about by meaningful group interaction results in a wealth of significant material. In fact, free association as we know it in individual analysis is the only major element that cannot be duplicated in the extended groups. Yet the work in the extended groups proves that the group procedure does extremely well in eliciting meaningful associations. difficult task indeed. He should attempt to observe the reactions of all group members and, at the end of the session, ask for unexpressed feelings, hoping that at least some will be remembered. Of course, the longer sessions provide the extended group members with more opportunity for self-expression. At the same time, the therapist does want to help his patients and would like to see progress. For those reasons alone, he should ask himself a few simple questions about his feelings and reactions toward each of his patients. For instance, how does he feel about each of the group members who do not show much reaction toward him? It may actually be the patients who are not behaving in any unusual way toward the therapist that make him feel rejected, and he may not even realize it. Or does one or more of the patients represent parental or sibling figures to the therapist? If so, how does that influence his actions and reactions? Does he identify with one of the patients? If so, how does that make him feel toward the patient? Does he like him for it or dislike him? Does he feel sorry and protective toward the patient? How does the therapist see the group in his mind? Does he see it as his family or as the family he never had? How does he deal with his groups? Does he behave as his father or mother behaved or, perhaps, in the opposite way? a different matter from the same action by a patient for whom the therapist has negative feelings. There is always the danger that the therapist will rationalize his feelings and possibly harm the patients. Thus this kind of self-interrogation can only have a salutary effect on the therapeutic work and stimulate increased insight in the therapist. The satisfaction of greater and valuable understanding will compensate for any temporary hurt to his ego. So far in this chapter we have described the format of the intensive, extended groups and the techniques that can be most advantageously applied. Yet all that amounts to an empty shell, devoid of value, as long as the core—the soul, if you will—is missing. And the soul is the quality of the work done within the framework we have outlined. Previously in this volume we showed how psychotherapy has deteriorated. We also mentioned a decline in the last two decades in the overall quality of group psychotherapy, where the more thorough forms of analytic group therapy have been increasingly displaced by easy-to-practice, superficial approaches. At the same time, as Stanley Lesse and many others have consistently pointed out, selection and training of practitioners have greatly deteriorated. Intensive clinical training, which is indispensable, has been increasingly supplanted by academic course work that is of little value and is imbued with the freewheeling theories of professionals who have little clinical knowledge. It is regrettable when a shoe repairman bungles his work. But it is a far more serious matter when a psychotherapist, who, after all, is supposed to be a repairman of emotional ills, does shoddy work. Countless people who could be helped are not obtaining relief from their suffering. It is for that reason that we have previously stated that group therapy is of value only when the therapeutic work is of high quality. The responsibility for the care of the emotionally ill lies with the mental health profession. It is unconscionable to support systems and approaches that ignore the suffering of so many. Unfortunately, the trend has been for shorter treatment time and more superficial treatment procedures. In the more than 75 years of its existence the American Mental Health Foundation has vigorously opposed practices it considered detrimental to the public interest. We cannot politely look the other way while professional shortcomings or lack of interest prolong the ordeal of so many human beings. Many valid remedies are available and we must not hesitate to apply them, even if doing so will inconvenience the professionals who are operating comfortably in the present system. The reader, then, should not be surprised if we use strong language in objecting to approaches that we consider clinically unsubstantiated, irresponsibly superficial and harmful to patients. The trends of our times are so powerful that even well-meaning therapists are swayed by them unless their own clinical expertise and knowledge of psychotherapy are firmly established. Only the power of those trends can explain why so many professionals have become embroiled in flashy theories and scholarly ruminations far removed from the realities of the human psyche and of no interest to expert practitioners. kinds of patients by what kind of therapists under what kind of conditions? We will address the second part of the quote first. It takes incredible näivete to believe that those questions can be answered in that manner. The simplistic, pseudoscientific proposal reveals an utter lack of understanding of the human psyche as well as of psychotherapy. Perhaps some mental health ‘scholar’ will answer Scheidlinger’s questions merely by referring to the myriad of writings dealing with one or more of the topics involved. Such a treatise would first ask which of the twenty-odd categories of therapists would be suitable to deal with the clinical categories mentioned in DSM-IV and would then answer specifically the additional questions raised by Scheidlinger. The whole enterprise would cover many volumes but be devoid of any value. An additional thought in regard to Scheidlinger’s question ‘What kind of therapist?’: Is there really any kind of psychotherapist other than the one who has the talent and the expertise to deal appropriately with the intrapsychic problems of the patient, whether in individual, group or any other kind of treatment? Like surgeons, such therapists know what instrument to use, how to use it and when to use it. Unlike surgeons, however, therapists have only one speciality—the vast and infinitely complex domain of the inner psychic structure and its functioning. In the first part of the quote Scheidlinger speaks of the various trends in group psychotherapy. He insists on the need for ecumenism among the various creeds and condemns ‘undisciplined subjectivity’. That may sound like democratic fairness to the credulous and the uninformed, and it is certainly a crowd pleaser, but it implies that something is valid simply because it exists. Scheidlinger includes everything, whether junk or not, in his populistic cocktail. Scheidlinger does not seem to recognize that our craft requires a gifted psychotherapist who is sensitive to feelings and dreams and who feels that it is necessary to obtain a deeper understanding of each patient’s unique inner universe and its workings. Doesn’t it occur to him that he might be selling snake oil? Ten years later it has still not occurred to Scheidlinger. In one of the least inspiring accounts of the history of group psychotherapy ever written, he still describes at length many superficial and one-sided approaches but merely allows a few lines, peppered with negative comments, for the comprehensive, in-depth intrapsychic psychodynamic group treatment forms (Scheidlinger 1994). None of his vaunted democratic fairness is shown here when it comes to the most valid but more difficult and sophisticated group therapy methods. As a supporter of the group-as-a-whole and group process approaches, Scheidlinger also speaks highly of the interpersonal, transactional approach as represented by Yalom. We have analyzed Yalom’s approach to a large extent in Part III of our companion volume and looked at its pretentious superficiality, lack of logic and unfounded populistic claims. Yalom, like so many others, emphasizes the here and now and proclaims that psychoanalysis and analytic group therapy, like the one we are advocating, are lacking in that element. It is foolish for him to say so and foolish for anyone to accept such statements. What could be more in the here and now than the reactions of the analysand toward his therapist and the reactions of the group members to those present? Scheidlinger states correctly that therapy groups are not the best place to study the so-called group process. He should have carried that statement a little further and said that any emphasis on group process has absolutely no place in therapy groups. What must happen in therapy groups, exclusively and at all times, is what psychotherapy commands, and that is an altogether different matter. Careful and skillful analytic work in the group will reveal, to a significant extent and in an impressive majority of cases, the child’s world that operates in each patient. There are no ‘group processes’ to be found in that world. The expert clinician is able to work with those clinically verifiable facts without the subterfuge of labor-saving intellectual constructs. We started out by stating that the core issue is the quality of treatment, which depends on the talent and expertise of the therapist. In the hands of a therapist who does not have talent and expertise, format and technique are merely gimmicks. How, then, can quality be achieved? In our companion volume, Crucial Choices Crucial Changes, we devote several hundred pages to answering that question. We show where the problems lie that must be avoided at all costs and we give solutions for (I) obtaining far more adequate trainees for the profession of psychoanalysts and psychotherapists; (2) ensuring a far more fruitful, less wasteful course of study; and (3) explaining a vastly different therapeutic effort enabling therapists to obtain far better understandings of the individual psychodynamics of their patients and, consequently, to do quality work on a deeper level. The insistence on expert work will substantially alleviate the suffering of innumerable patients. We also must not forget that a patient who pays for intensive, extended psychodynamic group therapy out of his own pocket will obtain better treatment than he would for lesser treatment modalities financed by third-party payers. In view of the ever-increasing and undesirable intrusion by managed care and third-party payers into the practice of psychotherapy, the treatment method described here may well become the only intensive psychodynamic therapy form that can be dispensed without unwarranted and damaging interference. That, of course, does not apply to the limited number of affluent patients who can afford costlier treatment procedures. The required efforts described in the companion volume apply equally to individual and group psychotherapy. If practised by a psychotherapist who has the required talent and expertise, quality work will be the result. Moreover, considerable experience over many decades with intensive, extended groups has proved that this treatment method offers a hopeful solution to the most pressing problem in the field of mental health effective, affordable treatment for a great number of the emotionally ill. If feeling fails you, vain will be your course. To hold its sway in every listening heart. Scheidlinger, S. (1984) ‘Group psychotherapy in the 1980s: Problems and prospects.’ American Journal of Psychotherapy, 38. Scheidlinger, S. (1994) ‘An overview of nine decades of psychotherapy.’ Hospital Community Psychiatry, 45. Wolf, A. (1949 & 1950) ‘The psychoanalysis of groups’. American Journal of Psychotherapy, 3 _ 4. Wolf, A. (1952) ‘The psychoanalysis of groups: the analyst’s objections’. International Journal of Group Psychotherapy, 2.
de Schill, S. (1954) Introduction to Psychoanalytic Group Therapy. New York: AMHF-Brunner (6th rev. ed., 1971). de Schill, S. and LaHullier, D. (1956) The Practice of Mental Health Groups. New York: AMHF-Brunner. Wolf, A. and Schwartz, E.K. (1962) Psychoanalysis in Groups. Orlando, FL: Grune & Stratton. de Schill, S. (1969) The Dream in Group, the Group in Dream. New York: AMHF. de Schill, S. (ed) (1971) Psychoanalytische Therapie in Gruppen. Stuttgart: Ernst Klett Verlag (2nd ed., 1974). de Schill, S. and LaHullier, D. (1973) ‘Groupes de sante mentale: une methode intensive de traitement’. In S. de Schill (ed) La Psychotherapie de Groupe. (Bibliotheque de l’Institut de Psychanalyse). Paris: Presses Universitaires de France. de Schill, S. (ed) (1974) The Challenge for Group Psychotherapy. New York: International Universities Press. de Schill, S. (ed) (1980) Terapia Psicoanalitica de Grupo. Milan: Feltrinelli Editore. 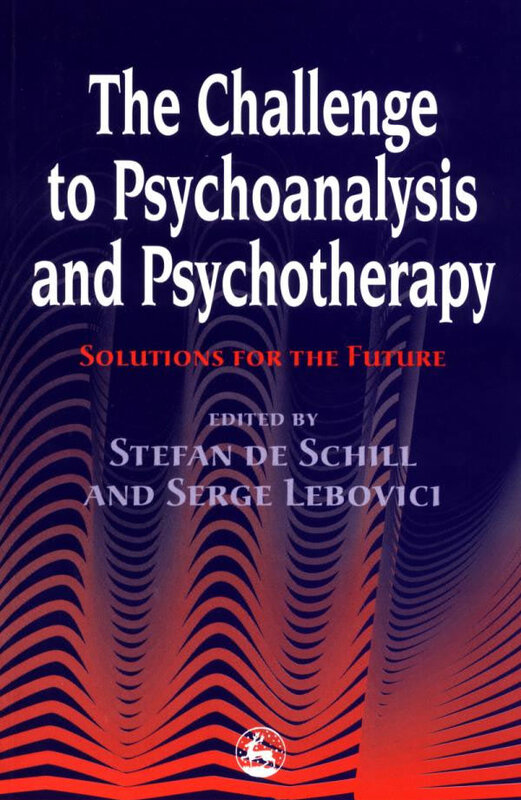 de Schill, S. and Lebovici, S. (eds) (1997) Le Deji pour la Psychanalyse et la Psychothérapie: Solutions pour l’Avenir. Paris: Presses Universitaires de France. de Schill, S., Lebovici, S. and Kachele, H. (eds) (1997) Herausftrderungen an die Psychoanalyse und die Psychotherapie: Losungen fiir die Zukunft. Stuttgart: Georg Thieme Verlag. de Schill, S. (ed) (1999) Crucial Choices—Crucial Changes. The Resurrection of Psychotherapy. New York: American Mental Health Foundation.